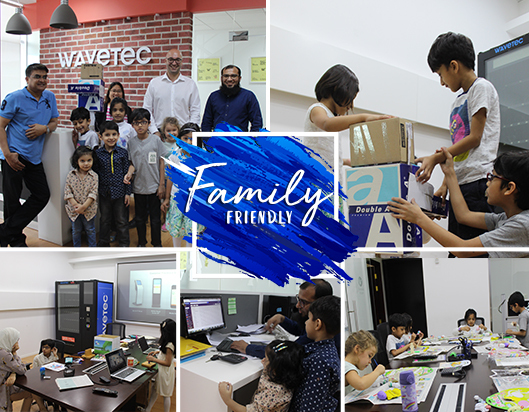 The wellbeing of our families is at the core of our culture as we at Wavetec well appreciate the challenges that our parents and families face in managing their responsibilities. This forms the foundation for many of our “Family Friendly Initiatives”. These initiatives include from allowing extra time to care for loved ones to family health and educational support programs. Initiatives have also been taken to create a kid -friendly work environment which allows parents to bring their kids to the workplace, if ever the need arises, this also creates a sense of belongingness and comfort zone for the kids at their parents’ workplace. We also believe that early child and parent bonding is at the core of cultivating a happier tomorrow and therefore we at Wavetec have also developed initiatives where parents can take extra time to care for their newborns.